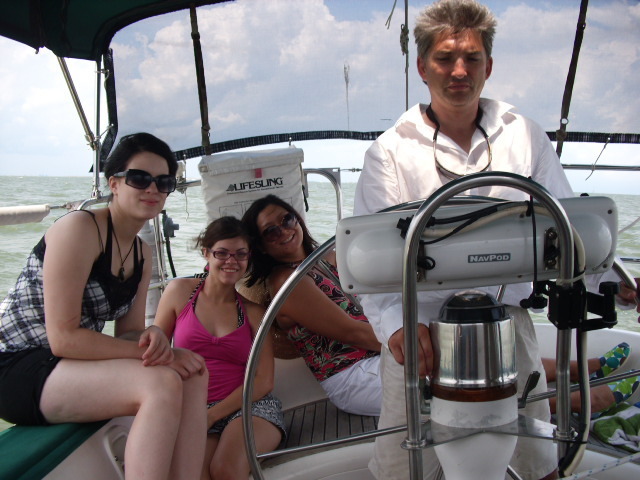 We were able to go sailing on Sunday, July 19. We had a boat full of wonderful friends and family- my good friend the beautiful ( and very pregnant) Alma and her cool husband Alan, my gorgeous nieces Victoria and Madeleine ( who turned 17 on the 19th! Happy Birthday!) and Ben, who turned out to be a crack crew member. We were a bit concerned about whether or not there would be enough room in the cockpit for 7 adults but we managed just fine. Mark spent a good bit of time on the safety and sailing briefing so everyone knew what to do and when to do it. I highly recommend spending an hour making certain the guests know what to expect and how to crew effectively- its more fun when everyone participates. 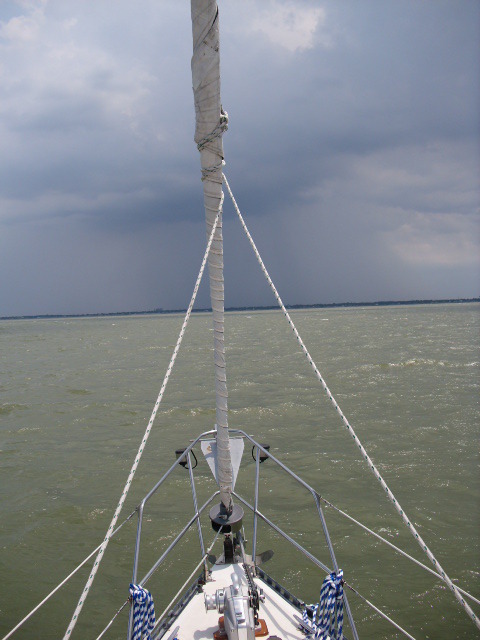 We left the marina with a forecast of 15-20 knot winds and a possibility of thunderstorms. Since we have been suffering in drought like conditions as of late, we were undetered by the possiblity of rain. We knew if the weather turned sour we would drop sail and motor back in so we stayed within a few miles on the marina just in case. Early on, the weather was breezy and there was just enough wave action to make it fun. We bounced along while everyone got to know the winches, lines and sheets and how to operate them correctly. While were out getting toknow Ceol Mor, we were treated to a pod of about 6 dolphins playing just 20 yards off of our starboard side. I need to get better about keeping the camera and video handy as I was so busy trying to crew, I missed the opportunity to photograph them. This will not happen again. 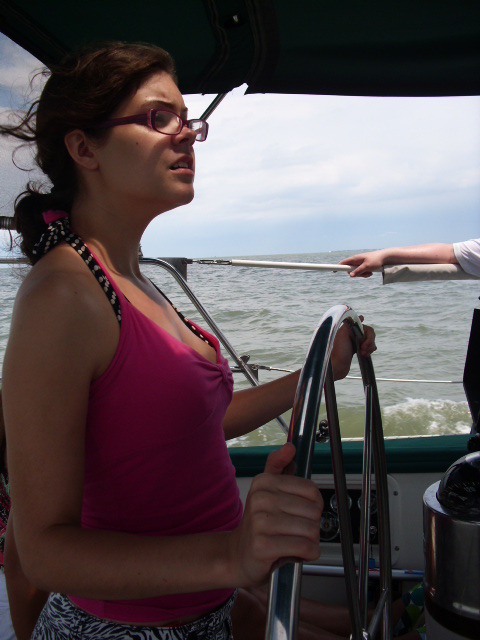 Victoria did a long stint on the helm and did an admirable job. She never panicked and took instruction exceedingly well. Alan and Ben did a great job manning the winches and their extra upper body strength was appreciated when the winds picked up to 20 knots. Madeleine hung out and Alma gestated quietly. I looked off to the West and saw really ugly, dark, lightening filled clouds approaching. 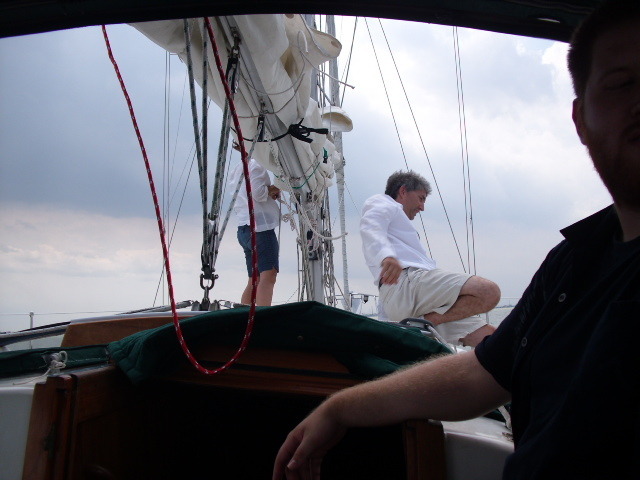 Mark was his usual cool self, I was my usual chicken baby self and requested an early reefing of the main and furling in the genoa. Mark likes to wait to see what the wind will do, I like to assume it will get nasty and proactively preapre for the worst. Mark ignored my pleas and carried on. The main sail ripped at the reef point when the wind picked up. Would we have a rip had Mark thrown in the extra reef when I asked him to? Hard to say, but I like to think that I was right and since I am writing the blog, we will all assume this was an "I told you so" moment. 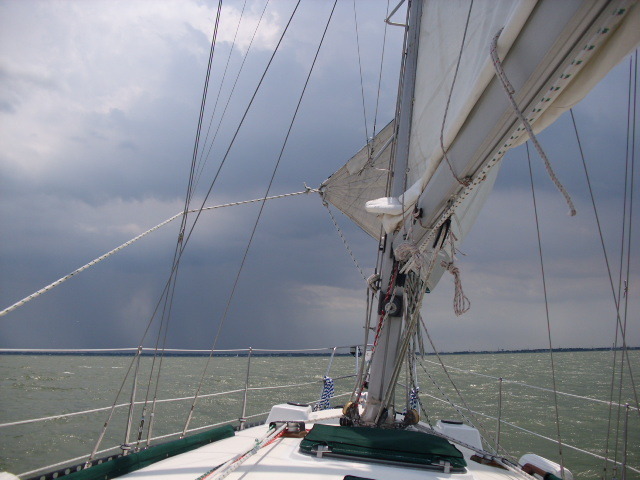 We dropped sail and motored back in just as the rains began to come down. 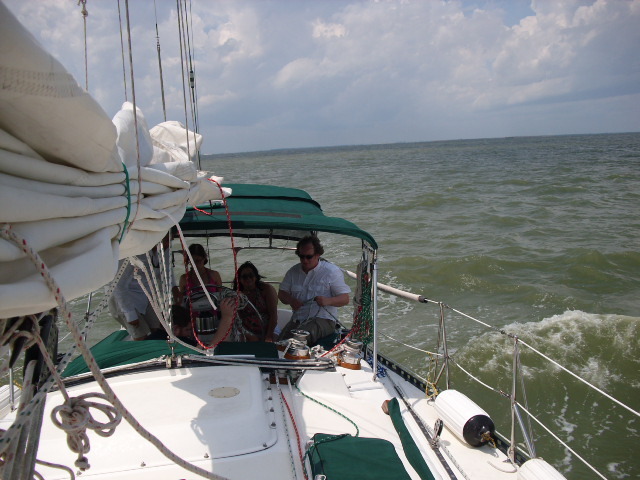 The ladies retreated to the cabin below while the manly men battled the current coming into the channel and got soaked. The rain stopped and the sun came out just as we were approaching our slip at the marina. With so many deck hands, we were able to get Ceol Mor into her slip with very little worry or bother except for the old dude who felt he should be captaining the boat, not Mark. It was a bit annoying for Mark to be telling me one thing only to have Old Barnacle Bill on the dock telling me to do the opposite. I ignored Barnacle Bill's instructions but did say " Thank you so much for your help" as he turned his back and wandered off down the dock. Ah well, one of the best parts of sailing are the people you meet- even crusty characters, maybe especially the crusty ones. These are the type people that cartoons aer made of and personally, I LOVE cartoons. When last you visited with your intrepid would be-sailors we were dealing with fall out from a blown exhaust elbow. Yes, the survey had picked up that the elbow had corroded and would need replacement. We just thought perhaps we could replace it during the haul out, the elbow had other plans and wanted to be put at the top of the punch list. Our engine is a Perkins 4-108 and for the most part, it is in very good condition. This is a good thing because it is just about impossible to find a replacement parts. We looked everywhere for a stock ehaust elbow- at chandleries, marine diesel engine shops, Perkins dealers, etc. We did not limit our search to those in our local area, we cast the net for the part far and wide to no avail. You simply could not buy a replacement part from stock. An internet comrade ( thanks Cam!) suggested we try Trans-Atlantic diesels. http://www.tadiesels.com/ While they did not have the replacement part, they did offer to fabricate us a nwe one if we would send them our old one. We loved their Can-Do attitude, their professionalism in answering questions very quickly what we didn't love was the price. They were not over charging by any means, just charging a fair price for their efforts. Unfortunately or fortunately ( depending on how you look at these things) our number one goal while refitting Ceol Mor is to do so and still slow the hemorrage the bank account has been suffering of late. Hey..wait a minute. Mark can fix or build anything. Seriously. Mark spent a couple of nights in the garage with his grinder, the old exhaust elbow and stainless pipe and elbow purcahsed from Grainger. A trip to Hobby Lobby (seriously) produced a fine sheet of copper which would be cut into gasket for the exhaust elbow. A bottle of whisky and a trip to Mark's friend Christian's home work shop (with TIG weld) produced the end result of a beautiful stainless steel, well gasketed and perfectly welded exhaust elbow at a savings of 75% of retail. Thank you Christian and well done to you and Mark! The new part was tested at length on July 4 and it performed beautifully.